Walnut Shell will likely leave no profile on steel. It is far less abrasive than other sandblasting medias, such as crushed glass or copper slag. It can leave a profile on soft substrates such as aluminum, copper, brass in coarse sizes such as the 12/20 and 8/12. Allows for preservation of base/primer, while removing top layers of paint (excellent for air craft carriers, submarines, boats.) For steel boat hulls, you can use coarser sizes like a 12/20, but for very delicate fiberglass hulls you may want to use something as ffine as the 30/100 or even 40/100. 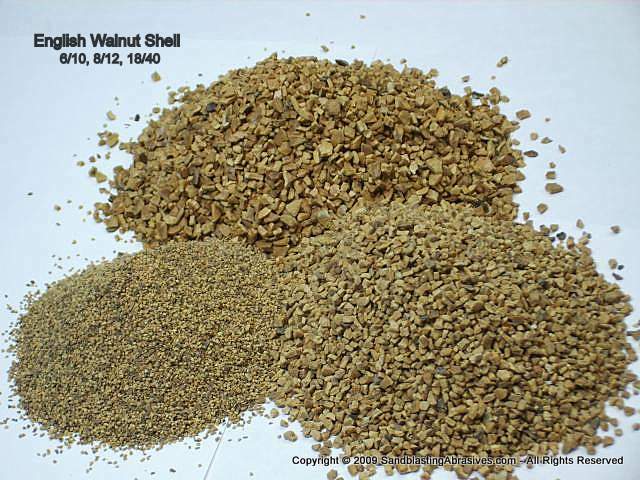 Walnut shell flour and filler sizes also available. Shipping: Usually sold by the pallet or 2000 lbs. (40, 50lb bags.) with multiple shipping points. You can, however, buy single bags of a very limited number of grit sizes, at the top of this page. Please email us for a custom freight quotation on orders over 250 lbs. We will need to know your ship-to address, and whether or not you have a loading dock on your end to receive the media. 50lb bags, 40 bags per pallet. 2,000 lbs per pallet. Minimum Order: One full pallet. You can, however, buy single bags of a very limited number of grit sizes, at the top of this page. 2,000 lbs super sacks, one sack per pallet. Media consumption will vary dramatically depending the user's job, but 2# per cubic foot is a decent ballpark number to go by. This is not a guarantee or an absolute, as the actual number will tie in with blasting pressure, substrate and toughness of the coating. It is always recommended to start with a low pressure and work it up as needed. Actual pressure will be related to the substrate and how much damage you want done to it, if any. For general aggressive sandblasting, a 80-100 psi at nozzle is common. Consumption: When blasting metal - 5-10lbs per sq. ft. is a good place to start. Other applications will run you much less, around 1-2 lbs per sq ft.
Anti-Slip Applications Consumption Rates: Varies dramatically, but a good ballpark is to figure 5-10 lbs per square foot of area. When mixing it directly into a paint or coating, use 2lbs per 5 gallons of paint as a start. 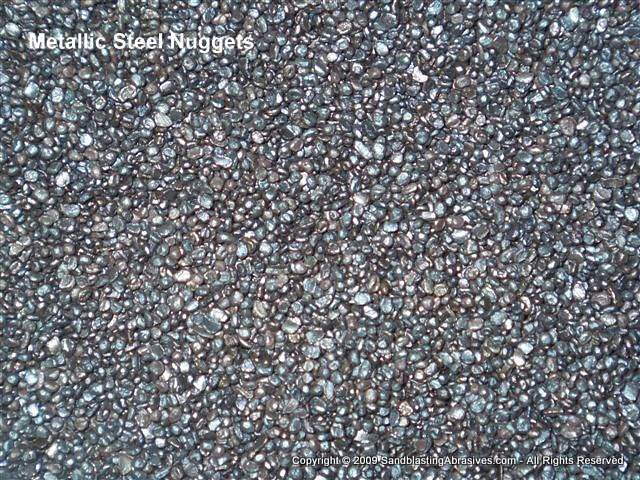 Any grit size is suitable for blasting metal. If there are grooves and fine areas, you will need a finer media to get into them. If it's a flat surface, the larger the better (metal substrates only). If you want to do more than remove a coating, and want to effect the substrate, then going to a coarser size than normal would be the best place to start. Cosmetic walnut shell is not sterilized, you will have to do this yourself. Blasting Brick: Pay attention to the condition of the mortar! Walnut usually does an effective job of removing paint from brick without damage, but if the mortar is in poor condition, it may be too aggressive and will pit/damage the mortar. Use a finer size in this case, and adjust your pressure. Blasting Boat Hulls: If it's a steel hull, a 12/20 should work fine. If it's wood or fiberglass, you will want to use a smaller size, even as low as 40/100 if it's delicate. Blasting Log Homes: A 3060 Black Walnut is preferred by most people, although a 2030 can be used also. Black Walnut will leave less scarring and pitting on the logs because the shell is a bit thicker than English walnut. If what you want to remove has good adhesion, and/or multiple coats of paint, then the coarser 2030 would be preferred. Just know you can overdo the 2030, which can eat into the logs if your coating is thin and easy to remove. Start with a lower pressure and increase it as needed. Some government jobs and oil field drilling applications will require black walnut. Ditto on some oil filter applications. English Walnut Shell vs Black Walnut Shell, for blasting applications. What is the difference? Black walnut shell is thicker and harder, so in larger grade sizes, it will appear rounder than english walnut. You will see less pitting and scarring when blasting wood (such as a log home) when using Black Walnut Shell because it is rounder. English walnut shell is more lightweight, has a thinner shell, and contains a lot more pith or membrane. However, for those of us using it for sandblasting, either will work just fine for you.